There are three things in this world that are true. The Sun is hot. Water is wet… and swords are awesome. As I sit here in the sword wing of my Warehouse of Bizarrchaeology, I find myself gazing over racks and racks of blades and I start to consider… what of these are the Top 4 Most Awesome Swords. EVER (everyone does a Top 5 or a Top 10, I’m going for a Top 4). The Ancient Egyptian Khopesh Sword is based on one simple question, why have a sword or an axe when you can have both? And thanks to King Eannatum of Lagash who was the first to give this weapon a go back in 2500 BC, now you can. The Khopesh was rather short at 24 inches long but the blunted end proved very effective at being used as a hook to surprise an unwitting opponent. The Khopesh sword was incredibly popular and was an Egyptian warriors weapon of choice and must have fashion accessory for close to 1200 years. Why settle for one, two, three, four, five or six blades on your sword when you can have seven? That’s a motto to live your life by and that’s exactly what the Baekje Dynasty in Ancient Korea around 372 AD did, constructing this mightily impressive and over bearingly bladey Seven Branch Sword. This weapon was never intended for battle and was instead built for ceremonial purposes. But having sharpened up the Iron blade and swinging it around a bit I can assure you that it is highly effective as chopping seven melons in half. AT THE SAME TIME. There are many different Gladiator types, the net and trident wielding Retarius and the gladius swinging Samnite amongst the most well known, not so the scissor holding Scissor Gladiator. The tube like metal casing protected the Gladiator’s forearm in a bout, whilst the curved blade at the end allowed for parrying, slicing and hooking. In Ancient Roman times these three features combined to make for a crowd pleasing weapon. The problem with using a sword in battle is that it can be rather restrictive, it has a specific length of blade that only has a certain attack distance. This does not apply to the Urumi Swords and that is precisely what makes the Urumi Swords so phenomenally awesome. Imagine a sword crossed with a Slinky and you have a Urumi Sword (get back on your feet once you’ve recovered from the sheer awesomeness of that statement and continue reading). Developed in the Southern States of India during the Maurya Dynasty, this bladed whip like sword can only be used by an expert trained in the Indian Martial Arts. Why? Well, the danger is that as you flail around with this giant extendible sword you might accidentally cut your own face off. Which believe me you would not want to do (to fix this would require even more super glue than repairing Napoleon’s sword). 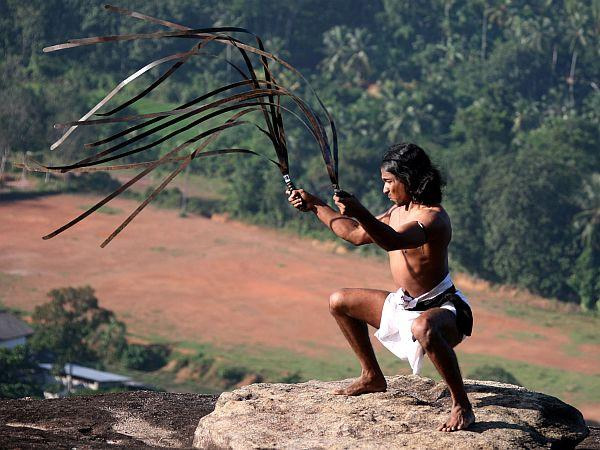 The standard Urumi consists of only one blade that is four to five feet long, however, the Sri Lankan verision has up to THIRTY TWO blades attached to one handle. Not only that but the warrior would fight with one Urumi in each hand, leading to SIXTY FOUR blades whizzing around the place. And the best thing about the Urumi? After you’ve finished the swings, spins and turns that make up the attack pattern you can wear the Urumi around your waist like a belt. Which surely must be the best belt ever. So not only is the Urumi the most awesome sword ever it is the most awesome belt ever too. So, there you have it, the Top 4 Most Awesome Swords. EVER according to Captain Max Virtus. Does your list differ? Have I caused a horrible and irreproachable offence by not including your favourite historical sword? Then let me know in the comments below (of if you’re reading this on Tumblr, send me over a question). *Whilst this list was called the Top 4 most awesome swords. EVER. It did not include swords not invented yet, otherwise this list would have obviously contained a Lightsaber.